The dragonfly is an amazing creature. As a boy growing up in rural Alabama in the 1960’s I and my friends were avid insect collectors. Butterflies, like zebra swallowtails and giant swallowtails, and moths like Luna moths and Prometheus moths and giant beetles like rhinoceros and stag beetles were an obsession. But they were easy to net compared to dragonflies. Dragonflies are the F-16’s of flying insects. They can fly 45 mph, and nearly 20 in reverse, climb in a full vertical tail stand and descend as steeply, turning as needed on a dime…with 7 cents change. Iridescent in greens, blues and magenta they were as irresistible as they were unattainable to a little boy with a butterfly net. 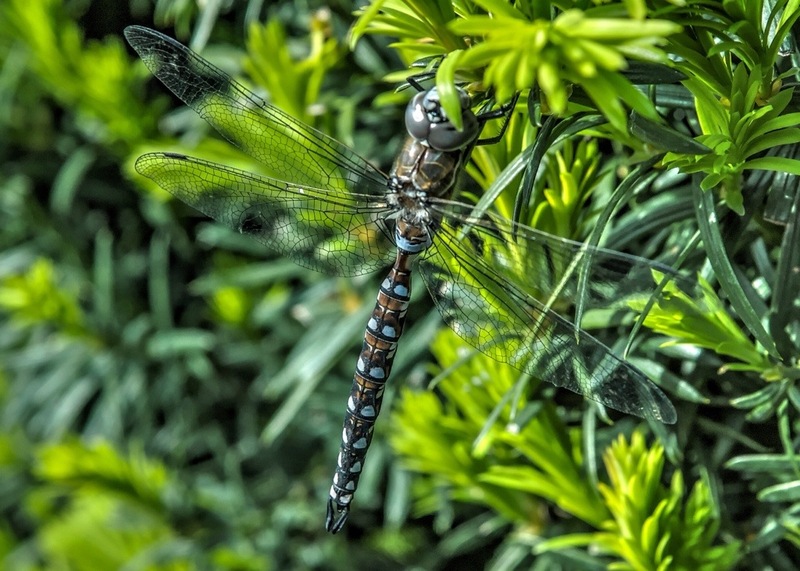 So it is no surprise to me as a grown man, bordering on old age, that dragonflies have special significance. But it is especially poignant as we prepare for a move of nearly 3000 miles, across the continent from east to west and from south to north. This entry was posted in compassion, gratitude, meditation, mindfulness, Uncategorized and tagged Buddhism, dragonfly, meditation, mindfulness. Bookmark the permalink. ❤ dragonflies! One of my totems. So much juicy stuff here. I didn't know the dragonfly can fly up to 45 mph. Amazing! My sense, from hanging out with dragonflies, is that they can really see me with those, big orbit eyes. One thing I've been noticing about them lately is how they dive while they are feasting on mosquitoes. The patterns they make with their movements – down, up, around, spiral, etc. – are magical and worth studying. Bet those patterns hold some cosmic messages.